Which might lead you to ask: How was the sniper tracking the target as it traveled down Elm St? 2.3ft x 18.3 frames per sec = 42.09ft per sec = 28.63 mph. 28.63mph is much more reflective of a lead height of 6.7 inches. Whereas, 2.8 inch lead height (previous posting) is more reflective of 11.2 mph. Does the difference in lead height of 6.7 inches (CE560) which is reflective of a limo moving at 28.63 mph(extant z207-208) have a correlation with the limo moving at 3.73 mph at z168-z171(CE884)? The WC (Shaneyfelt) liked working with averages, easier to hide instantaneous results. Difference ratio in horizontal change between these two = 1.4/.9 = 1.555…..
1.555… x .05 vertical change = .0777…. On the SS 12-5-63/FBI combo survey plat, if you look closely, someone(possibly West) marked extant z207. This mark is the 163.65ft flatline distance West measured. The X #1 designation is supposed to represent where the SS/FBI determined the first shot occurring. This is actually 10.2ft father west than Robert West's 163.65 flatline distance = extant z207. So the FBI has taken their original location of the 1st shot and relocated it 10.2 down Elm St. in the direction the limo was traveling. Do you have any thoughts as to WHO was the architect of these synchronized new locations? P.S. The limo traveling at 28.63 mph circa extant z207 would equal a one shooter tie-in to the SE 6th floor location. 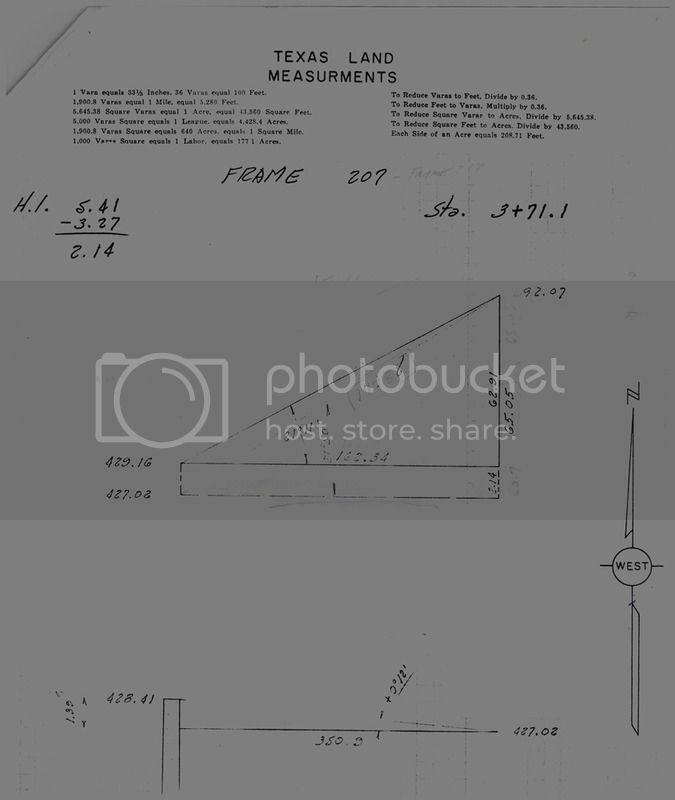 Post #72-78 is a good synopsis of the importance of 8.8ft, along with the previous few posts. Looking at CE560, a few remarks are in order. Mr. SHANEYFELT. Yes; because we were able to determine the speed of the camera, and thereby accurately determine the length of time it takes for a specific number of frames to run through the camera at this 18.3 frames per second, and having located these frame positions in the street, we took the farthest distance point we had in the Zapruder film which was frame 161 through frame 313. This was found to run elapsed time from the film standpoint which runs at 18.3 frames a second, runs for a total of 8.3 seconds. This distance is 136.1 feet, and this can be calculated then to 11.2 miles per hour. The vertical lead time height for the 175ft shot circa extant z207 is 6.7inches according to CE560. I ran these numbers paralleling what I believe Frazier was working with. You asked me about the above figures on another thread. Sorry for taking so long to respond. I've had a lot of difficulty logging onto the Ed Forum in the last week or so. The bullet described in this table is not exactly the same as a 6.5mm Carcano bullet fired from an M91/38 short rifle. For example, this bullet is .40" calibre, while the 6.5mm bullet is .256" calibre. This bullet had a muzzle velocity of 2325 fps, while Frazier found C2766 to have a muzzle velocity of only 2165 fps. Most importantly, this .40 calibre bullet has a ballistic coefficient of .196 (G1 drag curve model), while the round nosed 6.5mm Carcano bullet has a BC of approximately .311. The BC is a measure of how much resistance a bullet encounters while travelling through the air, and the higher the BC is, the more streamlined the bullet is. 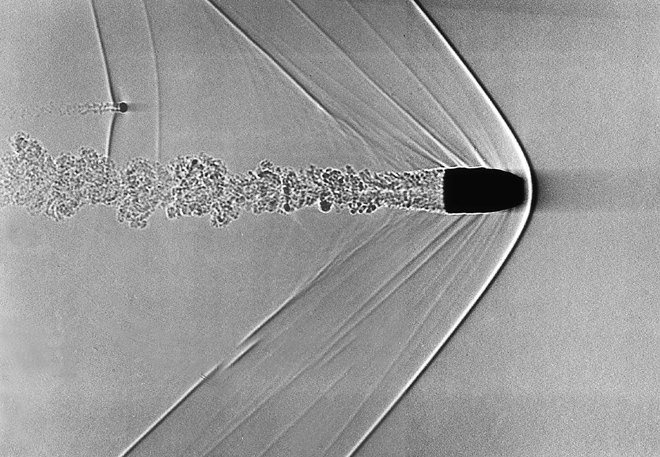 The BC is directly related to how quickly a bullet begins to slow down after leaving the muzzle, and that determines how quickly a bullet drops in-flight. Long pointed bullets with tapering "boat tail" bases are the most streamlined, while round nosed (or flat nosed) bullets with flat bases are the least streamlined. The flat base is extremely detrimental, as a vacuum is created behind this base that gets filled by turbulent air spilling over the sharp corner of the base. It is interesting that the two bullets are almost identical in weight, but that one has a BC of .196 and the other a BC of .311. It is likely due to the Carcano being a much smaller calibre, spreading the weight out over a much longer bullet and presenting a smaller, less resistive face. Whatever the case, I do not think a fair comparison can be made between the two bullets as far as bullet drop is concerned. This is the result for the limo at 11.2 mph 28.6mph. Mr. FRAZIER - The first shot, Lot 6,000, the velocity was 2199.7 feet per second. Shot No. 2, Lot 6,000, velocity 2,180.3 feet per second. The third shot, velocity--same lot--velocity 2,178.9 feet per second. The third shot, velocity--and this is Lot No. 6,003--velocity was 2,184.8 feet per second. The fourth shot, Lot No. 6,003, was 2,137.6 feet per second. Fifth shot, Lot No. 6,000, 2,162.7 feet per second. The sixth shot, Lot 6,003, 2,134.8 feet per second. An average of all shots of 2,165 feet per second. Mr. EISENBERG - How would you characterize the differences between the muzzle velocities of the various rounds in terms of whether that difference was a large or small difference? Mr. FRAZIER - This is a difference well within the manufacturer's accepted standards of velocity variations. They permit in their standard ammunition manual, which is a guide to the entire industry in the United States, a 40-foot-per-second, plus or minus, variation shot to shot in the same ammunition. Mr. EISENBERG - Have you calculated the muzzle energy of this 6.5 millimeter ammunition in this weapon? Mr. FRAZIER - It was furnished by letter to the Commission. Yes, sir--the muzzle energy was calculated on the basis of the average velocity of 2,165 feet per second as 1,676 foot-pounds. Mr. EISENBERG - This is a calculation rather than a measurement? Mr. FRAZIER - Necessarily a calculation, because it is merely a term used to compare one bullet against another rather than for any practical purposes because--because of the bullet's extremely light weight. The bullet's velocity and weight, and gravity enter into the determination of its energy in foot-pounds. As a mathematician myself, I'd have to say that this thesis does lack an amount of cohesion. Perhaps a single document, with its intention clearly stated, and hypothesis demonstrated within acceptable margin of error, with no pictures of dogs. I find this quite hard to read, but if it helps, you can't average averages (though I can't quite tell whether or not you're doing that as part of your calculations). This is conversion work. I'm not sure what you mean in regards to averaging averages. Perhaps a mixing of average vs instantaneous. You'll have to provide an example (Added on edit: possibly post#13) and hopefully I can provide an explanation. 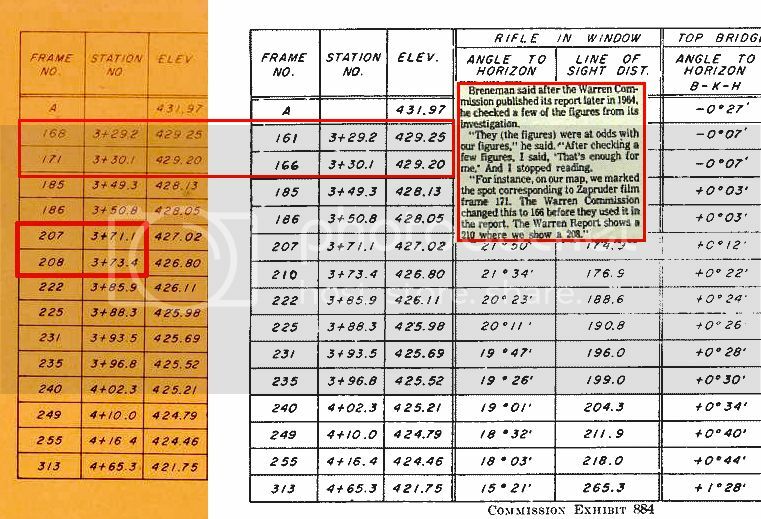 Survey info for Z207 tells us the rifle barrel end was determined to be 1.17ft above the window frame sill. When converted, this equals 14.04", which puts it 4.04inches above the sniper perch box. ...with no pictures of dogs. What? I LIKE dogs...don't YOU like dogs? My vote: The dogs stay in the thread. ...you can't average averages (though I can't quite tell whether or not you're doing that as part of your calculations). FWIW I haven't seen this done in any of Chris's calculations. How did I arrive at 1.17ft above the windowsill ledge for surveyed zframe 207? 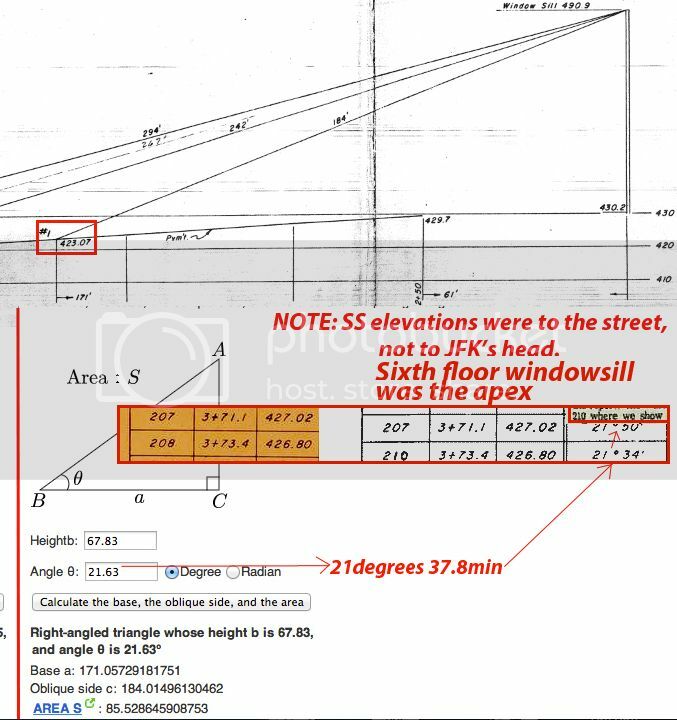 The windowsill elevation is 490.9ft, look at the top right of the graphic within this post. Subtract these two and the difference is the rifle height above the windowsill. Subtract this street elev of 423.75 from the windowsill elevation of 490.9ft, since this is to the street. You have to remember there are measurements to the street and measurements to a spot 3.27ft above the street.